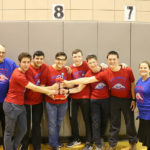 On Sunday, February 25th, the MTA Robotics teams, Lionotics and Lionotics 2, went to Townsend Harris High School in Queens to compete in the First Tech Challenge New York City State Championship. Lionotics has been doing these competitions for years, while Lionotics 2 is a new team, which was created this year due to the large number of students who wanted to join the Robotics team. Both teams had done extremely well in the qualifiers and were prepared to try to advance to the North Eastern Super Regional. They would have to beat the best teams in New York City in order to advance. Lionotics had completely redesigned their robot since the last competition, while Lionotics 2 had only made slight tweaks and improvements. Therefore, Lionotics had high expectations and hoped that their design would work well, while Lionotics 2 was confident in the incredible consistency of their robot to take them through to the elimination rounds. In the first few rounds, neither robot performed up to par. The Lionotics’ new system didn’t work like it was supposed to, and although both robots’ autonomous programs worked very well and consistently, and the robots did score some good points, the teams simply couldn’t pull out wins, losing a few very close games. Then something clicked for Lionotics 2, and they made up some ground by having a few great games. As they went to Mincha before the draft of teams for the elimination rounds, they all hoped that they would be selected to join a good alliance and go on to win. The draft was filled with tension. Would Lionotics 2 be selected to join those fighting for the championship? The answer, as it turned out, was yes. Lionotics 2 was selected by the alliance made up of the two teams with the best records at that point. The three teams proceeded to win the best-of-three semifinals in two games, almost doubling the other teams’ scores. They then also swept the championships, with Lionotics 2 having an incredible game. The whole team sang “mishenichnas adar marbim b’simcha” as they realized that they had been one of only five teams in the whole New York City, and the ONLY yeshiva high school team, to qualify for the Super Regional Championship of the entire North Eastern United States! While the next competition takes up an entire weekend, including Shabbos, we hope that the organizers will be able to help us and make sure that we can still compete. Congratulations the the entire Robotics team and thank you to all of them and to the faculty members who made this all possible for their hard work! Good luck to the team as they prepare for the Super Regional! Click here to view photos. If you would like to sponsor MTA’s Robotics teams or want guidance in starting your own team, please contact bjacob@yuhsbstudents.org. To learn more about the FTC First Tech Challenge, click here.